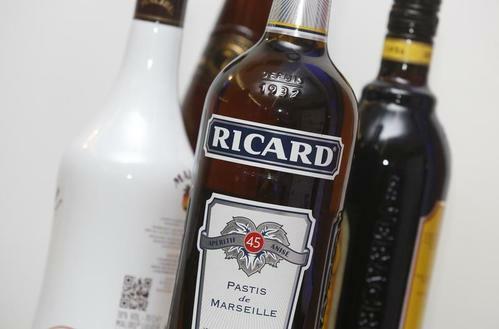 Reuters UKPernod Ricard (PERP.PA) raised the prices of its spirits in Britain in March to protect margins against a slide in the pound stemming from the country's vote to leave the European Union, according to company slides released ahead of an analyst call. 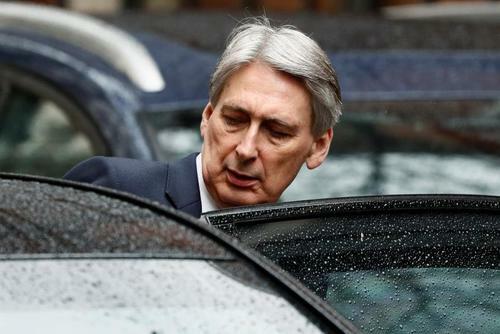 Reuters UKChancellor Philip Hammond said on Wednesday he was confident the country would negotiate a customs arrangement with the European Union that would allow for borders to be as frictionless as possible after Brexit. 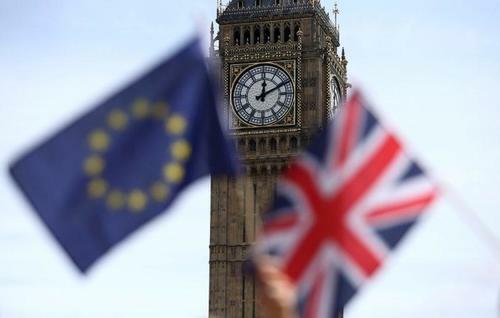 Reuters UKEuropean Union lawmakers want to tell Britons they can change their minds and stay in the EU after Prime Minister Theresa May triggers a two-year Brexit countdown on Wednesday. 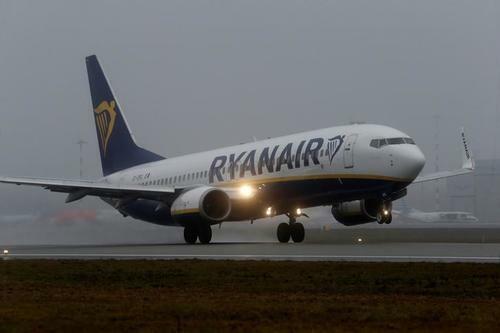 Reuters UKIrish low-cost airline Ryanair warned that it would not be able to fly between Britain and Europe if the country did not agree a new aviation deal as part of the Brexit negotiations which will be triggered later on Wednesday. 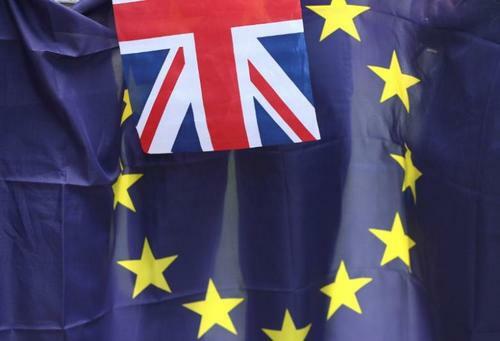 Reuters UKAs the United Kingdom prepares to trigger its divorce from the European Union, many Britons who have made Berlin their home are scrambling to get German citizenship as they try to ease worries about whether they can stay after Brexit. Reuters UKThe European Union's chief Brexit negotiator Michel Barnier said he would defend the rights of expatriates once Prime Minister Theresa May triggers Britain's withdrawal from the EU on Wednesday. 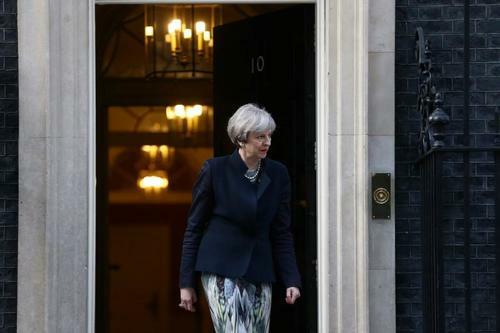 Prime Minister Theresa May will file formal Brexit divorce papers on Wednesday, pitching the United Kingdom into the unknown and triggering years of uncertain negotiations that will test the endurance of the European Union. Nine months after Britons voted to leave, May will notify EU Council President Donald Tusk in a letter that the UK really is quitting the bloc it joined in 1973. The prime minister, an initial opponent of Brexit who won the top job in the political turmoil that followed the referendum vote, will then have two years to settle the terms of the divorce before it comes into effect in late March 2019. Now that the decision has been made to leave the EU, it is time to come together," May will tell lawmakers, according to comments supplied by her office. "When I sit around the negotiating table in the months ahead, I will represent every person in the whole United Kingdom – young and old, rich and poor, city, town, country and all the villages and hamlets in between," May will say. British Prime Minister Theresa May signed a letter on Tuesday to European Council President Donald Tusk notifying the European Union of Britain's intention to leave the bloc, a photograph seen by Reuters showed. The letter is due to be delivered by hand to Tusk in Brussels on Wednesday by Tim Barrow, Britain's permanent representative to the EU. May will also notify parliament about the letter. Reuters UKThe Scottish parliament on Tuesday backed a bid to hold a new independence referendum in 2018 or 2019, but the British government immediately rejected the proposal. 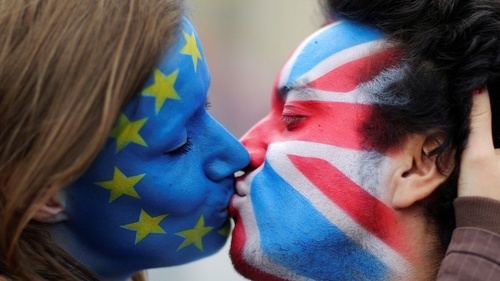 Reuters TVBritain's divorce from the European Union officially begins on Wednesday, but after 44 years of marriage both parties are looking at a messy prenup. The British government swiftly responded to the Scottish parliament's backing of a bid for a new independence referendum, saying that it would refuse to enter into negotiations on Sturgeon's proposal. "It would be unfair to the people of Scotland to ask them to make a crucial decision without the necessary information about our future relationship with Europe, or what an independent Scotland would look like," it said in a statement. May has previously said "now is not the time" for a new vote on Scottish independence and insisted her focus was on getting a good Brexit deal that would work for every part of the UK. Having won the vote in the Scottish assembly, Sturgeon said she would not seek discussions with London until after Article 50 was triggered because she recognised Wednesday was a momentous day and May should not be distracted. She told the chamber that if London sought to block her plan, she would return before the Edinburgh legislature after Easter to say how she would handle the situation. She gave no further details. ReutersWhile banks warn Britain's European Union divorce could drive the pound below $1.20, their option traders have cut the cost of insuring against further falls in the two years it has left inside the bloc. Scotland, like the rest of the UK, stands at a crossroads," Sturgeon told the Edinburgh assembly at the start of Tuesday's debate. "When Article 50 of the Lisbon Treaty is triggered tomorrow, change for our country becomes inevitable ... There will be an impact on trade, on investment and on living standards, and an impact on the very nature of the society we live in." The British government said on Tuesday it would not be entering into negotiations on the Scottish government's proposal to hold a new independence referendum in late 2018 or early 2019. It was reacting to a vote in the Scottish parliament earlier backing First Minister Nicola Sturgeon's bid for an independence vote. "It would be unfair to the people of Scotland to ask them to make a crucial decision without the necessary information about our future relationship with Europe, or what an independent Scotland would look like," it added. The Scottish parliament voted on Tuesday to back First Minister Nicola Sturgeon's bid to hold a new independence referendum in late 2018 or 2019, once the terms of the UK's exit from the European Union have become clearer. 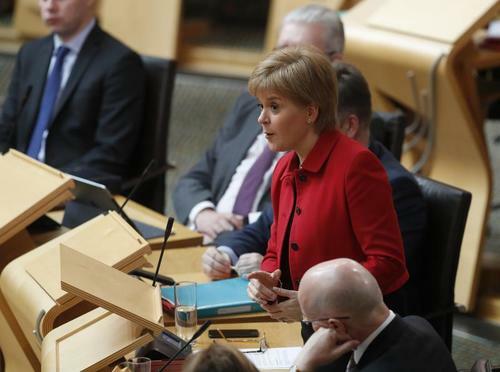 The Edinburgh assembly's vote, which was widely expected, gives Sturgeon a mandate to seek permission from the British parliament in London to press forward with preparations for a referendum. Scotland voted against independence in a 2014 referendum, but Sturgeon argues circumstances have changed since then because the UK as a whole voted to leave the European Union while Scotland voted strongly to remain in the bloc. 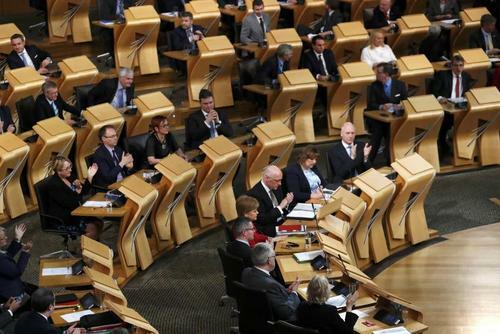 The motion, put forward by Sturgeon, passed by 69 votes in favour and 59 votes against in the Scottish parliament. Scottish parliament on Tuesday backed First Minister Nicola Sturgeon's bid for a new independence referendum, further complicating Britain's political situation just as years of talks on the terms of Brexit were about to begin. Reuters UKPrime Minister Theresa May will file formal Brexit divorce papers on Wednesday, pitching the United Kingdom into the unknown and triggering years of uncertain negotiations that will test the endurance of the European Union. Mayor of London Sadiq Khan says he will seek a "cast-iron guarantee" for EU nationals living in the UK. Banks are treading carefully, enacting two-stage contingency plans, to avoid losing nervous London-based staff as they work out how many jobs will have to move to continental Europe as Britain exits the European Union. EU BUDGET: WHERE'S THE MONEY GONE? The Union's budget accounts for only 2 percent of public spending in the bloc. But in the east, transfers from Brussels contribute a much bigger share - some 8 percent of Poland's budget and nearly a fifth of Bulgaria's. Without Britain, Brussels will have about a sixth less to give to countries that are net recipients, setting up a fight between east and west over a 7-year spending plan from 2021. In the short term, there will also be a battle with Britain over what it owes on leaving. London may choose to keep paying for access to some key EU budgets, such as for research. But big accounts, like farm subsidies, could be in for radical review. 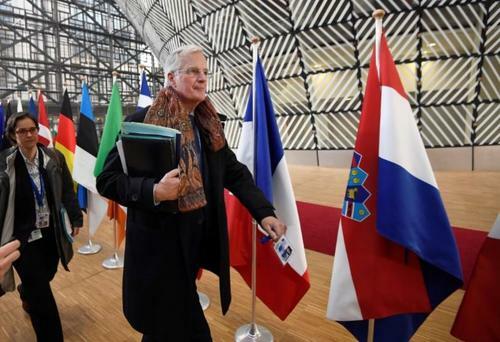 Britain has used its 12-percent share of EU votes to curb Brussels spending and push hard for free trade. Its departure worries smaller northern allies like the Nordics and Dutch. Poorer easterners, whose membership Britain championed, fret that Germany and France may stiffen barriers to their low-wage workforce or beef up EU federal powers the ex-communist states dislike. Aspiring new members, notably in the Balkans, also lose an ally against rich westerners wary of further EU enlargement. The 19 euro countries will lose a key block on their caucus power. They can now outvote non-euro states, but only just. A non-euro bloc led by Poland and Sweden would need major dissent among euro countries to prevent the euro zone setting EU policy. France becomes the EU's only nuclear-armed, veto-wielding U.N. Security Council member and loses a dogged opponent of its ambitions for more EU defense cooperation outside the U.S.-led NATO alliance; defense is already back on Brussels' agenda. Germany, ambivalent about being seen as dominating Europe by dint of its economic muscle and being home to nearly one post-Brexit EU citizen in five, is uneasy about how to maintain balance, notably with economically struggling co-founder France. The EU loses a hefty interlocutor with the United States and the wider English-speaking world. A historic diplomatic and military force, Britain's insight and influence with powers like China and Russia or in the Middle East have been useful to the EU. In Africa, a source of growing concern over migration, British aid budgets and other clout have played a key role. London's tough line with Moscow has won it friends among the likes of the Baltic states and the Netherlands, which fear that a softer approach from France, Italy and, possibly, Germany will undermine a consensus for pressuring Russia with sanctions over its actions in Ukraine or for cutting dependence on Russian gas. POLITICAL CULTURE: VIVE LE BREXIT? Though under-represented in the staff of EU institutions, British officials over 44 years of membership have established a key role in senior positions as well as in the EU parliament. That will disappear as British citizens are shut out of EU jobs. Many governments, notably from smaller states, value what they see as a British approach to administration that is more pragmatic and laissez-faire than the more centralized, dirigiste tradition embedded in the French foundations of the Union. 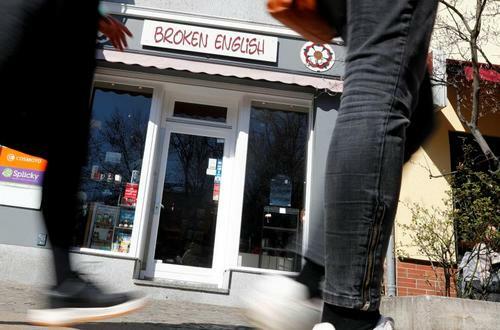 Britain will leave one legacy likely to survive in the form of English as Brussels' working language, despite some hopes in Paris of restoring the prominence of French. Since the Brexit vote, EU leaders speak of a renewed unity among the remaining 27. Polls suggest popular support for the EU has broadly increased. But unity will be sorely tested by Brexit negotiations, with governments all having differing priorities. The unprecedented use of Article 50 of the EU treaty breaks a taboo and means invocations of an "indivisible Union" now ring hollow. Brussels will have to contend with more threats to quit, coloring decision-making across the board for years to come. 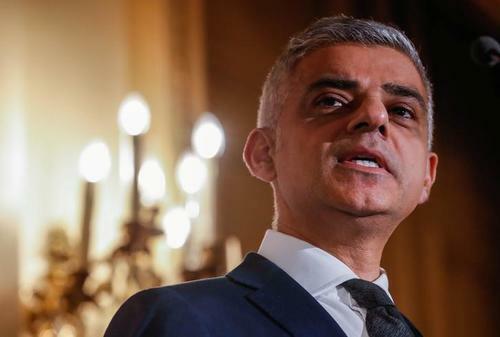 Reuters UKLondon will remain open to Europe and the European Union even after Brexit, the city's mayor Sadiq Khan said on Tuesday, while urging the British government to guarantee that EU citizens living in Britain can stay. Currency traders showed little sign of heightened nerves ahead of Britain's formal launch of negotiations on leaving the EU. Most analysts said the actual triggering of Article 50 will only have symbolic significance for investors, with the real driver for sterling being how negotiations with the EU will play out, and the health of the British economy going forward. 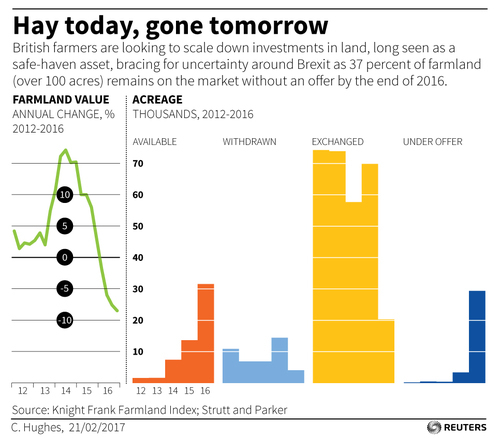 Investors' main fear is that a "hard" Brexit - one in which Britain would lose preferential access with its largest trading partner - would damage the British economy, which is showing signs of faltering. 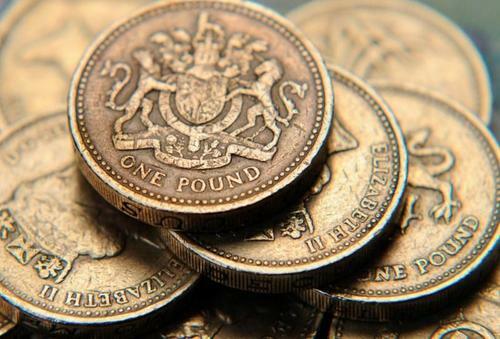 The pound, which has yoyo-ed in the past month between $1.21 and $1.26 was flat on the day around $1.2553. It was also flat at 86.52 pence per euro. 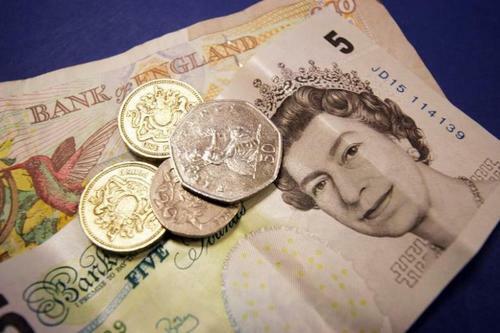 Stronger-than-expected UK inflation and signs the Bank of England is edging towards raising interest rates have helped the pound over the past two weeks. It hit a two-month high of $1.2615 on Monday in a move driven chiefly by broader weakness of the dollar. But uncertainty surrounding Brexit continues to weigh on the currency, still down by nearly 20 percent against the dollar since last June's vote. Adding to unknowns for investors have been rumblings of another Scottish independence referendum, which threatens a potential break up of the UK just as it departs the EU. Britain will consider all options for Northern Ireland including direct rule from London if politicians there fail to form a regional government in the next three weeks, the minister for the province said on Tuesday. 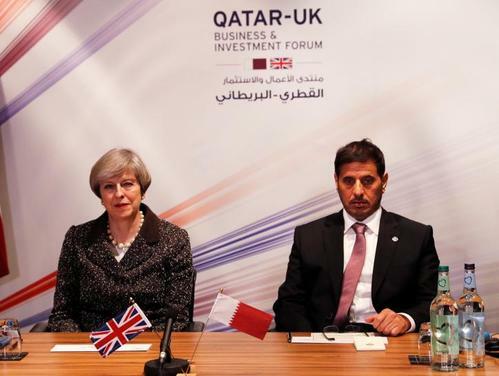 Reuters UKBritain is establishing a joint economic and trade committee to pave the way for a post-Brexit trade agreement with Qatar and the rest of the Gulf, Prime Minister Theresa May said on Tuesday. The British government will have to consider all options including direct rule from London if talks to resolve a political crisis in Northern Ireland and set up a new devolved government there fail, Northern Ireland minister James Brokenshire said on Tuesday. A deadline to resolve the crisis and form a new Northern Ireland executive passed on Monday without agreement. Brokenshire gave the parties more time to talk, but said the window of opportunity was short. "We do not want to see a return to direct rule," he told parliament. "But should talks not succeed in their objective, the government will have to consider all options. There is no public appetite, no broader appetite for another election in Northern Ireland - UK's Northern Ireland Minister James Brokenshire.